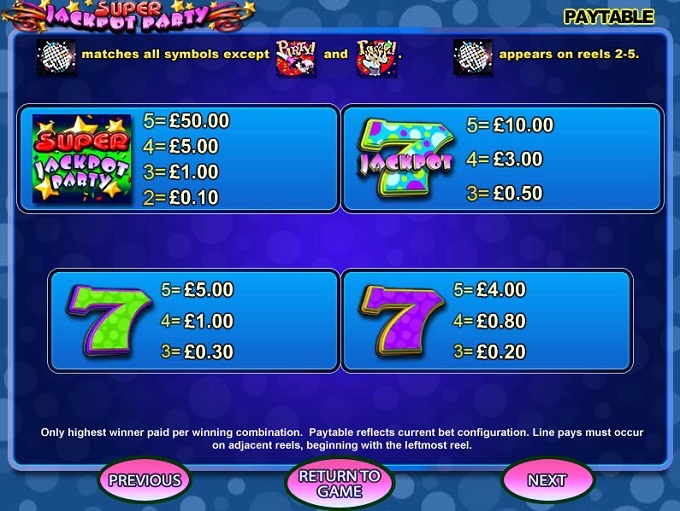 Designed by WMS, Super Jackpot Party is at the same time a slot machine with a classic theme and a title which tries to make things as fun as possible, just the effect that a party would have. The game’s party theme brings plenty of symbols that are appropriate for the topic, but there are also the 7 symbols which are used in about three different variants. All in all, it’s a game that will offer good prizes, but don’t expect a progressive jackpot when you read that title. This slot has a total of 20 paylines arranged on 5 reels. The various features, wild symbols and scatters which are part of the game sound good, but the best part would be the $25,000 jackpot. The slot’s offer consists of wild symbols, of scatters and various bonus games that will bring you prizes and a bit of excitement. The Disco Ball will bring you more wins as you play the game, being a wild feature which is only allowed to substitute for others, but not to create combinations directly. The reason is the way the wild appears, only on the last four reels of the slot. With the exception of the two feature symbols (Party Guy and Noise Maker), the wild can substitute for any other icon. This particular bonus game gets started when the Party Noise Maker is involved. You need three of these scattered symbols to get the feature going, and once that happens you will be presented with a collection of presents, from which you can pick. You get cash prizes or other bonus games. The round goes to Party Favor if you find the party pooper. When this bonus feature triggers, you are asked to choose one of the party favors that are shown, in order to locate the party saver. Find it, and you get another round at choosing presents. If you don’t locate it, the Party feature ends. 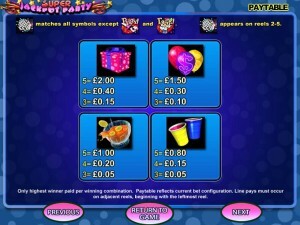 The betting range of Super Jackpot Party starts at only $0.20, which is a very accessible value, and it can go as high as $100 should your budget be on the high side. Each line uses a single coin and the value for it is between $0.01 and $5. 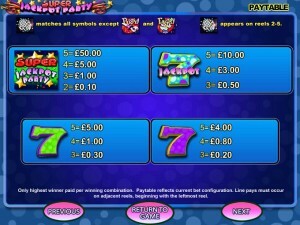 The slot’s 5,000 coins top jackpot is won with the right symbols in a combo. Up to $25,000 is the value of that prize that even the slot’s title mentions. Despite the definite retro influence on the slot’s design, I found myself enjoying it. It has a very nice party vibe about it, with lots of balloons, punch bowls, a psychedelic background behind the reels and the vivid colors which are used everywhere. As I’ve said, the influence is part classic (thanks to the 7 symbols) and part themed around the party topic. 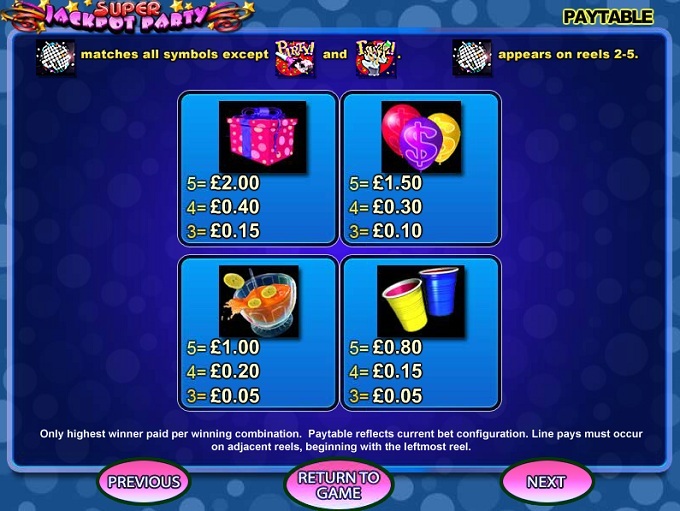 Symbols: Disco Ball (wild), Party Guy (scatter), Party Noise Maker (scatter), Game Logo (5,000 coins), Jackpot 7 (1,000 coins), Green 7 (500 coins), Purple 7 (400 coins), Present (200 coins), Balloons (150 coins), Punch Bowl (100 coins) and Cups (80 coins). The top prize and the features of the game are its best advantages, but I’m not as much of a fan when it comes to the design of the slot. You will find Super Jackpot Party at any online casino which chooses to use software from WMS, playable either for free or for real money.